I love a success story. Some of my favorites are Oprah Winfrey, Iyanla Vanzant, Tyler Perry, Mary J. Blige (my favorite singer), Queen Latifah, Ice Cube, T.I. (one of my favorite rappers), Will Smith, Jay Z, and even our President Barack Obama. Some of them grew up in poverty, some faced other challenges. The running theme is that all of them had a dream for their life and with the winning combination of talent, hard work, and the favor of God, they all became successful. One of my all-time favorite success stories is Steve Harvey. He is currently on the cover of People magazine with the title “From Homeless to $100 Million!” I also love a “saying,” I have some of my own and I appreciate other people’s sayings that stick with me. 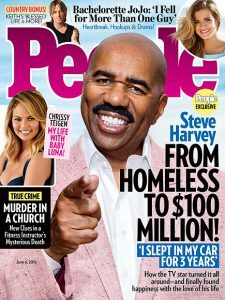 One of Steve Harvey’s sayings is “The best thing you can do for poor people, is not be one of them.” He didn’t make up this saying, but it is one that stuck with him and he often uses it. Let’s talk a little bit about Steve Harvey and about this saying. Steve was homeless for three years in the late 1980’s while he was in the building stages of his career. He struggled for many years to achieve the great success that we all see today. After years of hard work he is now a world famous comedian who has a syndicated radio show, several hit TV shows, he is a bestselling author, and a standup comedian. I enjoy many of his outlets, his stand-up comedy, his book Act Like A Lady, Think Like A Man, and the movie that followed, and I listen to his radio show almost every morning. What I love most about Steve is how down to earth he is. He doesn’t speak extremely proper, he doesn’t know all of the right things to say, he doesn’t look the part, he is just his regular self. His radio co-hosts often stop him during the radio show when he goes off the deep end. Being a regular listener of his radio show I have often heard him use the saying “The best thing you can do for poor people, is not be one of them.” Let me tell you why this saying resonates with me so much. In the People magazine article Steve shares that he didn’t know he would become this successful, God had a bigger life for him then he imagined. However, he did have a dream of using his comedic talent to become successful, he just didn’t know HOW SUCCESSFUL he would become. But he knew living out of his car flat broke wasn’t what he wanted out of life. His dreams of success combined with hard work is something he has in common with all of the individuals that I listed above. Each of them wanted something better out of life and now that they have it, they give back to others. How could they have ever gotten to the point where they could give back if they were still poor themselves? Oh, I know there is always a way to give back and help others, I get that. But I am talking about on the scale they are able to contribute by opening schools, sending young people to college, having mentoring programs, writing self-development books, employing other people which allows them to provide for their families, and even running the country and putting national programs in place to help all of society. You cannot thrive on that level if you are still poor, broke, and struggling yourself. And that is the point of Steve’s saying. So, let me tell you how this relates to my work as a Social Worker with people in poverty. We have several group meetings at the facility I work at and I am often flabbergasted by the remarks I hear from clients during these meetings. During discussions about education, employment, and self-sufficiency some of the ladies will say things like “So and So is successful and they didn’t go to college.” Or when we give them statistics and outcomes of the behaviors that come with poverty they say “well So and So didn’t finish school, or had multiple children, or went to prison, etc. and they are fine.” They totally miss the point that So and So grinded for it! And So and So then sent their children to college and now have programs and scholarships to help other people have opportunities they didn’t have. Steve Harvey hustled and grinded until he made a name for himself. In the People magazine article, he talks about washing up in hotel bathrooms before his shows, and how he had a cooler in his car and lived off of bologna sandwiches. He sent 75% of his earnings to his ex-wife and their children and barely scraped by on the rest. Tyler Perry wrote his own plays and put on productions when no one knew who he was, I read how he would go out on the streets and try to get people to come inside to see his plays. Jay Z wrote his own lyrics and started his own record label in his mother’s kitchen in the projects. Ice Cube wrote many of the lyrics for N.W.A., traveled the country building a name for his group and his self, then started writing and producing his own movies instead of just acting in other peoples. This is the missing “key” to the story that many people in poverty miss…………….they miss the fire, the hustle, and the grind. They see the outcome, but have no idea what these people put into it to achieve the grandiose results. I see people in the shelter every day who we hand deliver opportunities to such as free educational resources, employers, and community resources and they will not even get out of bed to come get it. Some of them walk around with a scarf on their head all day, some have the nastiest attitudes on earth, and unfortunately some have the classic sense of “entitlement.” By entitlement I mean the mindset that the government, organizations, and anybody with money owes them something. I have clients who I have gotten job interviews for and they didn’t show up, given bus passes to go see about employment and education resources, and they didn’t go, tried for months to get them to come to our appointment so we can make a resume and a job search plan and they never come. It can be very disheartening. This is not just my experience as a Social Worker, but quite frankly my experience of growing up in an urban environment. But please oh please do not stereo type! This is not ALL people in poverty nor ALL people in an urban environment, but unfortunately it is too many. When people display these behaviors there is almost always a reason. Their upbringing or lack thereof, trauma, pain, and so on. And let’s not forget as I explained in Poor vs Poverty and They Don’t Know They Don’t Know, poverty in and of itself has certain effects on the brain and produces negative behavior patterns, of which they often do not know are negative. I want to note that this is not the case with all of the people that I work with. I have several clients who are doing very well and working very hard to change the course of their life. Even though we haven’t known each other long, I hope that you can already tell that I am not judgmental. But I have to be honest about these issues because we can’t heal what we won’t acknowledge. You can’t heal a wound that stays covered up. Unfortunately, many people in our community are not motivated and/or display negative behavior patterns that keep producing negative results. Pretending it doesn’t exist isn’t going to help anybody. And what about the people who are motivated but do not know what to do to break through the barriers in their life? That is what my website and my blog are all about. People who want something different out of life, but do not know how to get it. Because that was/is me. I have been researching human behavior and success stories for years because I want something more out of life and I am determined to get it. Even a person who has a “good” job and a decent quality of life can be stuck. I am out of crisis, but I’m still in the struggle. I still feel stuck and I am striving to break free. I am tired of being broke, I am tired of depending on a job, I am tired of not being able to live life freely as I desire. I got over the stage of bad decisions years ago, then it was life setbacks that affected me. Losing my job, getting divorced, earning a low wage/salary. Now, I am at the stage where I am trying to break into the next level in my career and income. For each new level comes new challenges and barriers to overcome. I am determined to achieve my dreams and to live life to the fullest and it will not come from a “job.” It will come from me. That is what I am giving you with my blog……………me. That is what Steve gives us in all of his outlets, be it the radio, TV, books, or comedy, he is giving of himself. What do you have to give? Are you good at comedy, acting, singing, writing, caring for people, teaching people, making people beautiful by doing their hair, nails, or dressing them, can you cook good, do you take care of children well, can you defend people in a court of law, can you decorate and make any space beautiful, can you build anything from an art project to a house with your own hands? I give all of these examples to show there are a variety of talents and abilities that each of us has that we can use to not only make a living for ourselves, but to achieve our dreams. I encourage you to research some success stories, and see the running theme of having a dream, working hard, making mistakes and learning from them, and having faith in God. We have a long way to go as African Americans and there is no doubt still institutional racism in our country, but we have also come a long way and we DO have some opportunities. I may never reach millionaire status, but I WILL BE six figures at least! I may never be at the top, but doggone it, I don’t have to be at the bottom either! I CAN get an education, I CAN own my own home, I CAN drive a nice car, I CAN travel, I CAN have the finer things in life, I CAN have savings and investments, I CAN send my child to college, I CAN leave an inheritance for my child and my grandchildren, and I CAN be successful. I CAN do it and YOU CAN too! I would like to hear from you. What is one goal you have that YOU CAN DO? One of my goals, is to be the Best mother, Best Woman, I can be, not only for me but for my daughter. Someone she will always look up to no matter what we go through. 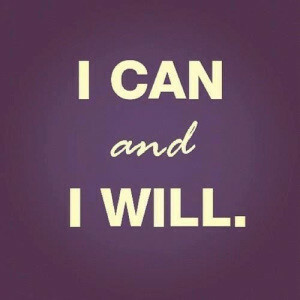 “I CAN AND I WILL” no matter what! Being a African American Educated woman I have come to realize that the real answer to poverty is prayer and preseverance. God gives promotion and he elevates responsible people according to his own timing. I too am a fan of Steve Harvey, Iyana Vanzalant, and Oprah Winfrey. They all experience the power of a higher being through their search for a better life and a better way. Yes, they worked for it, but their success started after their breakthrough. They all operate on a level of success that combats the issues of povery and that is that they continuosly work hard everyday by learning, doing, and giving back when and wherever they can. Success is a lifetime ordeal. When one owns what one has been blessed with poverty no longer exists. I admire successful people. They have character, they show preseverance, and they are leading examples and role models to and for people like me. These are successful African American people whom crossed the poverty thrush “A thing” we all must take personal responsibility for having and being afflicted with as women and as being African American. What a great article!!! I believe so many people can relate who have/are striving to get over a big success threshold. Identifying those who don’t want it versus those that will do whatever it takes to press beyond being “stuck” and move forward to success. Thanks for sharing this, this was right on time and serves as a personal reminder/confirmation for myself. Excellent points. I was the oldest of six children. My mom was a homemaker, and my dad worked two full time jobs to raise us. I am now a retired attorney. My testimony here is my dad’s. He taught us to work hard a do better for ourselves. I had to work to put myself through Wayne State because my dad had enough on his plate. Though I was a high school honor grad, I didn’t even apply to another college because I couldn’t be sure that scholarship money to an away university would be sufficient to get me through without asking my dad to get a third jog. My point is, we were in poverty sometimes, but a work ethic was instilled in us. If people don’t have that, it can be learned by putting one foot in front of the other. Be reliable; show up on time, build your reputation as a person who wants more. Help others along the way. Stay clear of hanging with people who don’t share your values. Work HARD! Success is a journey, not a jump. Joyce thank you for sharing. People need to hear stories like yours. Some may look at you and think it was easy, but it wasn’t. You worked hard and it paid off. We have to work to instill this wisdom into those who didn’t receive it at home. And we can do it together with Love! Thank you for taking the time to share!